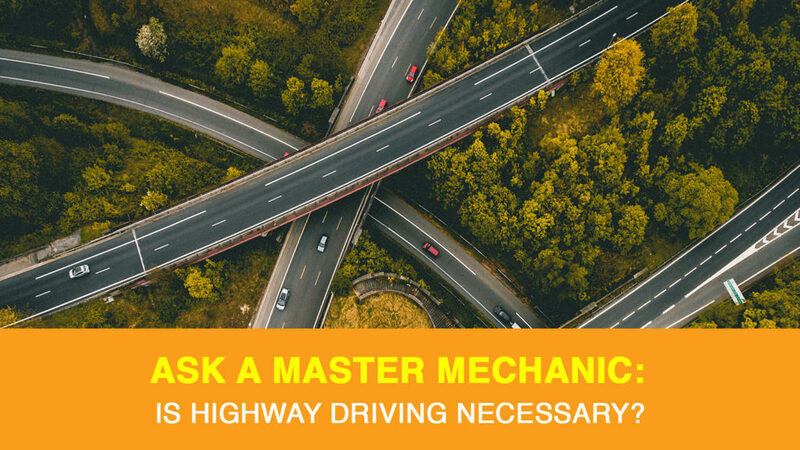 At Master Mechanic, we commonly get asked a certain question about highway driving. The short answer is no, there is no need to drive your car on the highway. The long answer is a bit more complicated because highway driving is definitely better for your car than city driving. Let your local Master Mechanic explain. Once upon a time, people used to talk about it was good to take your car on the highway to “clear out the engine”–because it was. What they were referring to was blowing out the carbon, but this isn’t needed anymore. You do, however, need to bring the engine up to operating temperature to ensure that moisture doesn’t accumulate in your engine’s oil. If left this moisture can combine with other chemicals and turn into acids and sludge which can prematurely wear out your engine. Do Modern Vehicles Require Highway Driving? Most modern engines use fuel injection, computerized engine controls and improved fuel types that help it run more cleanly by default. In fact, at Master Mechanic, we often see cars with 180,000 km that have surprisingly clean interior components. That’s because modern car engines are designed to keep up with modern driving habits, and that includes city driving. If you’re driving at least 15 to 20 minutes on a regular basis, you’re most likely giving your engine enough of a workout. If you’re constantly taking five-minute trips or less, you could cause corrosion in your exhaust system and moisture build up in the engine. While it’s not necessary for maintaining your car, highway driving does have its benefits. Highway driving is easier on every subsystem of the car. This is the reason you see so many used car ads talking about “highway mileage”. Your engine wears less by sitting in its ideal rpm range, but there are many other systems that benefit from the consistency highway driving provides. Since you don’t have to deal with stop lights, intersections, and traffic, your car’s brakes get a lot less wear. Highways generally have fewer potholes, so your car’s suspension has less work to do. Highways are also much straighter and bend slowly, so your steering system gets a break from the strain of sharp corners. Above all else, fuel economy increases when the engine operates at a constant speed. If you’re constantly driving on the highway that lessened wear can really add up to saving on repairs. When re-selling your car, if you can advertise it as primarily being used for highway driving or commuting, you’re likely to fetch a premium, too. At Master Mechanic, we don’t want you spending more on repairs than you have to. If you can incorporate highway driving into your regular commute, it’s always best to do so. If you can’t it’s not the end of the world. Proper maintenance will ensure your car still runs smoothly no matter what your driving habits are. As always, don’t hesitate to contact your local Master Mechanic if you have any questions, or to schedule an appointment for routine maintenance. We’re always happy to help! < Ask A Master Mechanic: What is a Sealed Transmission?